Candy corn really does look like teeth, especially the “autumn” kind with the brown ends. What You Need: 1 cupcake; white or off-white frosting; black gel or writing icing in tube; 5 candy corns (brown end or regular); 2 black or brown M&Ms. How to Make It: Frost cupcake. Use black writing icing to draw a skull shape (fat top and thinner bottom) on cupcake. Add 2 black M&Ms for eyes. 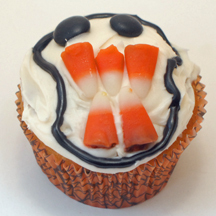 Break fat ends off of candy corns and arrange on cupcake with three “teeth” on top and two on bottom for mouth. This entry was posted on Friday, October 31st, 2008 at 11:31 am	and is filed under Halloween cupcakes. You can follow any responses to this entry through the RSS 2.0 feed. Responses are currently closed, but you can trackback from your own site.